Indus jewelry made of gold, agate and carnelian. The gold filigrees at the top would have been worn around the head, at the bottom is a belt or necklace or carnelian. 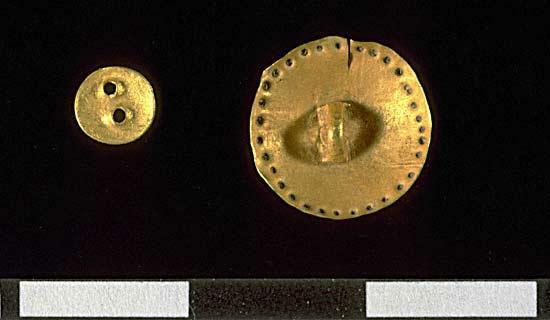 More gold, this time sequins from the pre-Indus Kot Diji phase (2600-2800 BCE) found at Harappa. A variety of golden artifacts have been discovered. 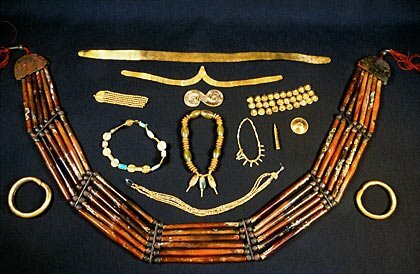 Here, we see a gold bead collection discovered at Harappa 2000-2001. 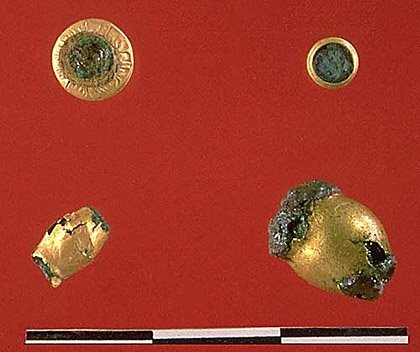 Other artifacts include a Composite Tubular Gold Bead, a pair of Gold Foiled Beads, and Bell Shaped Gold Ornaments. For more information about gold and Indus culture, read Jonathan Mark Kenoyer's article Wealth and Socioeconomic Hierarchies of the Indus Valley Civilizations.